Rekha Reddy is a name that is synonymous with Ikebana, given how much she has done to spread awareness of the art form. The artistic lady had finished her Master’s in food and nutrition, after which raising her children became her top priority. It was during this time that Ikebana evolved from being a hobby into an absolute passion. She now spends her time teaching and spreading the calming art of Ikebana as far and wide as she can. How did you get introduced to the art of Ikebana? Ikebana is the traditional Japanese art of flower arrangement.When my parents travelled to Japan in the late 1950’s, my mother fell in love with the country’s exquisite landscapes. She began putting together fresh flowers and foliage at home almost every day after that… and still does at age 82! I grew up in a house with potted plants and flower arrangements in every room, and I suppose I imbibed the interest from there. My teacher, Horyu Meena Anantnarayan, played a major role in fine tuning my skills. Observing and imitating nature is a major aspect of Ikebana. The outdoor picnics we had during our childhood – summer trips with stops every few hours, with long walks into the fields, along streams or under a tamarind tree – all heightened my senses. Even my husband and sons have always planned our vacations in wildlife sanctuaries; while they gaped at the animals, I took in the sights of the forests! What gave you the idea for your recent book, Blooms and Looms? I organise Ikebana exhibitions almost every year. Sometimes the exhibitions have themes like books, recycling, festivals, the life of Buddha, etc. I found it interesting to blend and showcase another aspect of life along with Ikebana. My first book, Petals & Palette, juxtaposes Ikebana and the paintings of legendary artist M.F. Husain. The second book, Flowers & Flavours, has Indian recipes along with arrangements using a food element or edible stem in each of them. It was so well received that we had to do a reprint in six months! My latest book has the theme of sarees. The affinity to sarees in the younger generation is dwindling, causing weavers to move away from their ancient crafts. The aim of this book is to bring about a renewed interest in sarees and to simultaneously inculcate a deeper awareness of nature and Ikebana. Our state government has recognised the effort and have kindly showed their support. 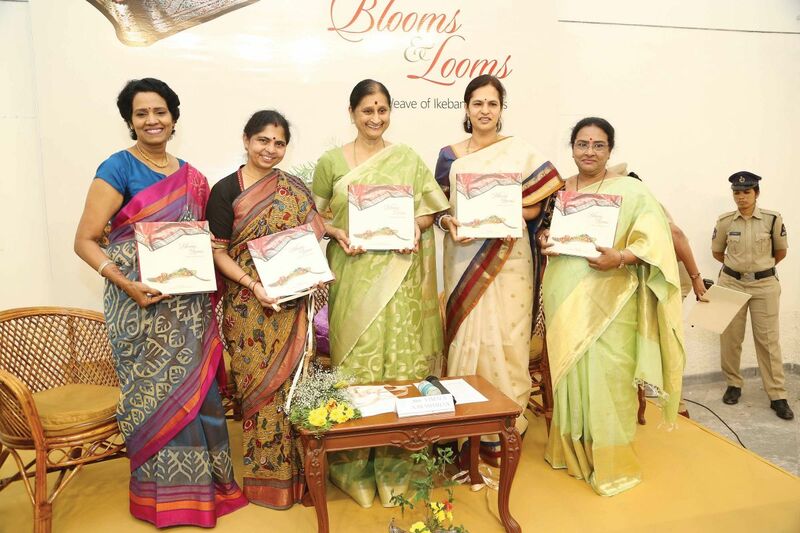 Three of my friends – Padma Duvvuri, a keen botanist; Indumathy Davloor, who has a flair for writing; and Nirupa Reddy, a teacher who volunteers at underprivileged schools – helped me put together Blooms & Looms – a Weave of Ikebana & Saris. All 55 participants in the book have been my students, and in a sense are co-authors of this book. 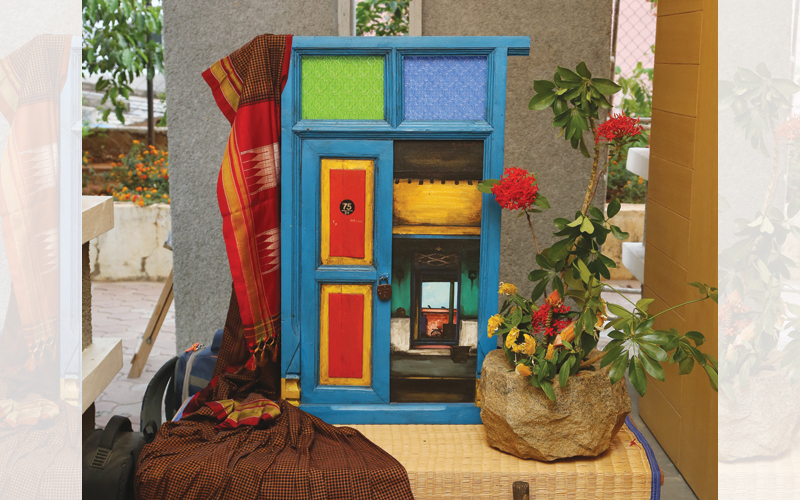 In this coffee table book, each participant has a photograph of a saree from her wardrobe and has done an arrangement next to it, matching the colour of the saree or connecting it to the area from where it comes. There is a brief note about the saree and the arrangement. The sarees are from different parts of India and of different weaves, embroideries or printing techniques. What are some of the challenges you’ve faced in your journey to spread awareness of Ikebana in the city? It has been a pleasurable and rewarding journey, spreading the art of Ikebana in the city and surrounding areas. One concern is that people believe it is an expensive hobby and that may be a reason to hesitate. In reality, however, one can even use dry twigs and stems, combine that with a few fresh leaves, flowers or potted plants, to make a simple arrangement in any handy container. What inspires you while practicing Ikebana?